1.1 In December 1994, the Environmental Protection Department (EPD) completed the Outlying Islands Sewerage Master Plan (OISMP) Study (EPD, 1994). The areas studied in the OISMP include Lantau Island, Lamma Island, Cheung Chau, Peng Chau and some other smaller islands to the west and south of Hong Kong. Recommendations on the improvements and extensions to the existing sewerage infrastructures were made. 1.2 The OISMP identified the need for improvement of the water quality of marine waters close to Peng Chau. Further to the OISMP, the Drainage Services Department (DSD) completed the Preliminary Project Feasibility Study (PPFS) for Package K – Peng Chau Sewage Treatment Works Upgrade. The study concluded that the existing capacity of the Peng Chau Sewage Treatment Works (STW) is inadequate to meet the increase in flow due to the proposed developments at Peng Chau. 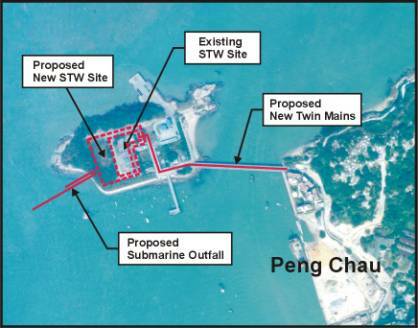 An upgrading and expanding of the existing Peng Chau STW with an oceanic submarine outfall is therefore required. The study also recommended to include Package K in the Outlying Islands Sewerage Stage 1 Phase 2 Works. 1.3 In August 2002, the Drainage Services Department (DSD) of the Hong Kong SAR commissioned CDM International Inc. (CDM) under Agreement No. CE83/2001 (DS) to carry out investigations, environmental impact assessments (EIA), design, tender, construction supervision and commissioning of Package K – Peng Chau Sewage Treatment Works Upgrade (hereinafter called the Project). 1.4 The submarine sewage outfall of this Project is a “designated project” category F.6 under Schedule 2 of the Environmental Impact Assessment (EIA) Ordinance (Cap. 499), and an environmental permit is required for the Project. An EIA report in accordance with the requirements under the EIA Ordinance and the EIA Study Brief is prepared. 1.5 The purpose of this EIA study is to assess the environmental issues arising from the construction and operational phases of the Project, and to recommend appropriate mitigation measures for all identified adverse environmental impacts. (i) Construction of remaining works. 2.2 Figure 2-1 illustrates the layout plan of the proposed STW upgrade. Based on the preliminary construction programme, the construction of the project is scheduled to commence in April 2005 and for completion in November 2007. 3.1 The principle purpose of this EIA is to assess the environmental acceptability of constructing and operating of the proposed Peng Chau STW Upgrade including the associated submarine outfall and emergency overflow outfall components. The study has been carried out in accordance with the guidelines in the Technical Memorandum on Environmental Impact Assessment Process (TMEIAP) as well as the EIA Study Brief. 3.3 The findings of the assessment are summarised in the following sections. 3.4 Representative air sensitive receivers (ASRs) were identified in the EIA Study and are shown in Figure 3-1. 3.5 Dust generating activities were identified and evaluated. If un-mitigated, construction of the Peng Chau STW upgrade would have short term adverse impact on air quality, in the forms of fugitive dust at the identified ASRs. The predicted construction dust impact exceeds the 1-hour and 24-hour TSP criteria at some ASRs. Mitigation measures including watering of on-site construction area are expected to limit fugitive dust levels to acceptable levels. Model simulation results show that the 1-hour and 24-hour TSP criterion could be met after implementing the recommended mitigated measures. 3.6 The implementation of the Air Pollution Control (Construction Dust) Regulation and good site practice during construction phase are recommended. 3.7 During the operational phase of the Project, all the potential odour generating facilities such as inlet works, grit chamber, equalization tank, SBR, sludge thickener, sludge digester, screening and grits storage area, return liquor pumping station and sludge drying bed would be enclosed by air-tight covers. Odourous gas would be ventilated to the deodourisation facility for further treatment before discharge. The deodourisation facility would be capable of removing 99.5% of odour. During sludge transportation, it is recommended that sludge should be carried by enclosed container to avoid unacceptable odour nuisance. 3.8 With the above mitigation measures, no unacceptable odour impact would be envisaged. 3.9 Representative noise sensitive receivers (NSRs) were identified in the EIA Study and are shown in Figure 3-2. 3.10 Construction noise impact from STW upgrade was evaluated. Key noise generating activities include construction of pumping mains, treatment works upgrade and demolition of old units, as well as outfall construction. 3.11 The predicted results show that the construction noise standard of 75 dB(A) stipulated in TMEIAP is complied at all identified NSRs from the proposed construction activities at all phases. However, the construction of Peng Chau Helipad would be taken place concurrently during the first year of construction when most noisy equipment plants are scheduled to be operated. To minimise the cumulative noise impact, a more stringent noise level of 72dB(A) is recommended to be observed by both construction sites. 3.12 Noise mitigation measures are proposed for the construction of STW upgrade. Two types of silencing PME are recommended to reduce the noise impact. Noise levels at identified NSRs after mitigating are all well below the proposed noise level of 72dB(A). 3.13 Exceedance of 72dB(A) noise level would occur by Helipad construction activities at the worst identified NSR with the implementation of mitigation measures. Scheduling of the STW construction have been properly arranged to avoid the elevated cumulative noise impact at the worst identified NSR. No exceedance of cumulative noise level of 75dB(A) would be resulted within the concurrent construction period of both projects. 3.14 No unacceptable residual impacts are anticipated during the construction phase. 3.15 The major noise generating equipment during operational phase are air blowers, ventilation fans and water pumps. Operational noise prediction is carried out assuming all the noisy equipment would be located outdoor without shielding. The predicted noise levels at identified NSRs exceed the daytime/evening and night time operational noise standard of 49dB(A) and 45dB(A), respectively. 3.16 However these noisy equipment are designed to be enclosed inside their respective treatment buildings. A reduction of 20dB(A) can be achieved if the building enclosures are built using suitable material such as concrete with surface density of 25kg/m2. With the proposed enclosure, the predicted noise levels during operational phase at identified NSRs are reduced and would comply with the operational noise standard during both daytime/evening and night time. 3.17 No residual operational noise impacts are encountered after implementation of mitigation measures. 3.18 Dredging activities for the construction of submarine and emergency overflow outfalls would elevate the suspended solids concentration in the marine environment. Assessment of sediment dredging has been carried out by predicting the increase of sediment concentration due to fine sediment lost to suspension. 3.19 High level of sediments which exceed the WQO criteria are predicted in the vicinity of the study area where marine ecological sensitive receiver corals are found. Mitigation measures are proposed for dredging activities. It is recommended that closed grab dredger, silt curtains with a minimum 75% solid reduction or higher are to be used and reduction in dredging rate is to be implemented. With the implementation of proposed mitigation measures, no exceedance of WQO criteria is predicted about 250m away from the dredged alignment. 3.20 Water quality impacts from the operation of Peng Chau STW upgraded have been assessed. Assessment of the near field dispersion from discharge of treated effluent have been carried out by using Visjet model for both dry and wet seasons. The modelling results show that adequate initial dilutions can be achieved for all discharge scenarios (planned average and peak average scenarios) at both seasons. The total concentration of SS, ammonia, unionised ammonia and E.coli would comply with WQO standard after initial dilution. Elevation in BOD concentration is not significant.The total concentration of BOD, SS, Ammonia, unionised ammonia and E.coli would comply with WQO standard after initial dilution. 3.21 Although no WQ standard is available for total residual chlorine (TRC- as a toxicant), USPEA criteria of 0.013mg/L and 0.0075mg/L are adopted at the edge of initial dilution zone for acute and chronic toxicity, respectively. The predicted results show that with TRC reduction to 0.8mg/L, the proposed criteria can be met and water quality impacts are not considered to be significant. 3.22 Total concentration of TIN is predicted to exceed the WQO standard, owing to its high baseline concentration. The dilution provided by the near field effect, however, allows the TIN concentration to fall within the natural variation/fluctuation range of a water quality monitoring station SM 10. The water quality impacts are thus considered to be acceptable. 3.23 It is expected that operation of the upgraded Peng Chau STW would be beneficial to the surrounding receiving water body. The current Peng Chau STW provides secondary treatment to sewage collected from residential developments at northern Peng Chau. Sewage from some village houses is still being discharged untreated. Prior to the operation of the upgraded STW, the Peng Chau Package K project would connect and divert the sewage from the majority Peng Chau household to the STW. Less discharge of untreated sewage would be anticipated. With the incorporation of denitrification process into the upgraded Peng Chau STW, the discharge of total inorganic nitrogen into the receiving water body would be substantially reduced. Long term improvement of water quality is anticipated. 3.24 Discharges of treated effluent via emergency overflow outfall in the case of damage or blockage of submarine outfall have been assessed. Visjet model was used for initial dilution prediction and subsequent far field dilution was determined by using Brooks equation. The predicted results show that adequate dilution can be achieved within a few hours after initial dilution. The predicted concentration of SS, ammonia, unionised ammonia and E.coli would comply with WQO standards after far field dispersion. Concentration of BOD and total residual chlorine would be insignificant. TIN remains as an exceeding parameter due to high baseline concentration. 3.25 In the case of failure of both STW and submarine outfall, untreated sewage would have to be discharged via the emergency overflow outfall. Water quality impact from peak dry weather flow scenario has also been assessed using the same methodology. The discharged effluent would have significantly higher pollution load than the treated effluent and a longer time is required for the effluent plume to achieve adequate far field dilution. Concentrations of SS, ammonia and unionised ammonia would comply with WQO standards. Concentrations of BOD and TKN would be insignificant. The concentration of E.coli, however, would still exceed the WQO criteria for secondary contact recreation zone. Mitigation measures are recommended to minimise the chance of emergency overflow of untreated effluent. 3.26 Review of previous sediment quality survey reveals that the sediment quality may belong to Category L according to the classification in ETWB TCW No 34/2002. A sediment sampling and analysis was carried out to verify the speculation. Results of chemical screening analysis confirmed that sediment in the proposed dredged area is uncontaminated and belong to Category L . The dredged sediment would be suitable for open sea disposal. 3.27 Waste generated by construction works include workforce waste, maintenance and chemical waste and construction and demolition material. With the implementation of appropriate mitigation measures during the handling, collection and disposal of construction waste material, the residual environmental impacts would be acceptable. The mitigation measures can be enforced by incorporating them into a waste management plan as part of the contract document. Environmental monitoring and audit would be necessary to ensure the implementation of correct disposal requirements for the various waste generated from construction works. 3.28 Dredging activities would be occurred at the proposed outfall. Approximately 22,000 m3 of marine mud would be dredged and disposed of. It is recommended to avoid the leakage of the dredged mud into the marine environment by implementing appropriate mitigation measures. The residual impact would not be significant given the small amount of dredged mud to be handled and disposed of. 3.29 Waste generated during operational phase of Peng Chau STW Upgrade would mainly be sludge from secondary treatment units. Two sludge dewatering arrangements have been adopted. The digested wet sludge would be barged away for centralised treatment and disposal of as the duty operation procedures in the initial stage of STW operation. Sludge can also be dewatered on site by drying bed to 30% solid content and for disposal of at designated landfill site when necessary. The operation will be reversed (i.e. drying bed for duty and export for standby) if the export option turns out to be constrained by the treatment capacity of designated dewatering facility or be less cost effective due to higher volume of wet sludge to be barged away. 3.30 The potential impact on marine ecological communities would be associated with construction of submarine and emergency overflow outfalls. 3.31 Impact assessments on the intertidal community, subtidal soft bottom and subtidal hard bottom (including corals) from habitat loss and sedimentation have been carried out. The overall impacts are considered to be acceptable. No mitigation measures for marine ecology would be required if construction water quality impacts are to be mitigated. 3.32 Zones of initial dilution (ZID) of the effluent discharge are localized in the vicinity of outfall. In the wet season, effluent quality after initial dilution for BOD, SS, unionised ammonia and E coli would not exceed the WQO. The total residual chlorine concentration is also found to be complied with the proposed water quality criteria if the discharge is reduced to 0.8mg/L. Elevated TIN concentration is predicted but it is due to elevated background TIN concentration in the Southern Water Control Zone. Benthic biota in the area are not higher in diversity and abundance than other regional areas and there are no significant coral communities in the ZID zone, impacts are therefore minor and mitigation measures would not be required. 3.33 In the dry season the ZID extend further from the outfall and significantly higher dilution are achieved. A small portion of the higher valued soft bottom benthic habitat that exists to the north west falls within the zone of initial dilution. However, water quality would be indistinguishable from the background, thus the operational impacts are anticipated to be insignificant and no mitigation measures would be required. 3.34 A baseline review was conducted on the cultural heritage sites identification, with data supplement from geophysical surveys at the proposed dredged area for outfall construction. There is no cultural heritage sites of interest are identified and impacts arising from the construction and operation of Peng Chau STW Upgrade is not expected. 4.1 A comprehensive environmental monitoring and audit (EM&A) programme was recommended for implementation during the construction and operation of the Project. The separate EM&A manual covers various environmental issues including air quality, noise, water quality, waste management and marine ecology. 5.1 The proposed Peng Chau Sewage Treatment Works Upgrade would provide a high level of treatment to the sewage collected from Peng Chau area. The treatment works upgrade is designed to improve the water quality in the vicinity of Peng Chau by adopting a more stringent discharge requirement for nitrogen and enhancing the dispersion of effluent discharge by submarine outfalls. 5.2 This EIA has identified potential environmental impacts due to construction and operational phase of Peng Chau STW Upgrade. Assessments on air quality, noise, water quality, sediment contamination, solid waste, marine ecology and cultural heritage have been carried out. Cumulative environmental impacts from projects in the vicinity of the study area have also been addressed. 5.3 Potential environmental and cumulative impacts would be anticipated during construction phase if no mitigation measures are to be implemented. Mitigation measures are also recommended to be implemented during the operational phase to minimise the potential impact. No cumulative operational phase environmental impacts are envisaged. No unacceptable residual impacts would be anticipated.